The IKEA Billy bookcase series is a classic design with an emphasis on functionality and flexibility. Coming in height variations for tall (93 1/4” | 237 cm) or short (41 3/4” | 106 cm), and widths of wide (31 1/2” | 80 cm) or thin (15 3/4” | 40 cm), the Billy system is designed to adapt to many types of spaces and uses. With all the pieces maintaining a depth of 11” | 28 cm, the various components of this particleboard construction system can easily be attached together into a seamless combination bookshelf wall or longer lower unit. The bookcase should be securely mounted to the wall with the provided anchoring fasteners for safety. 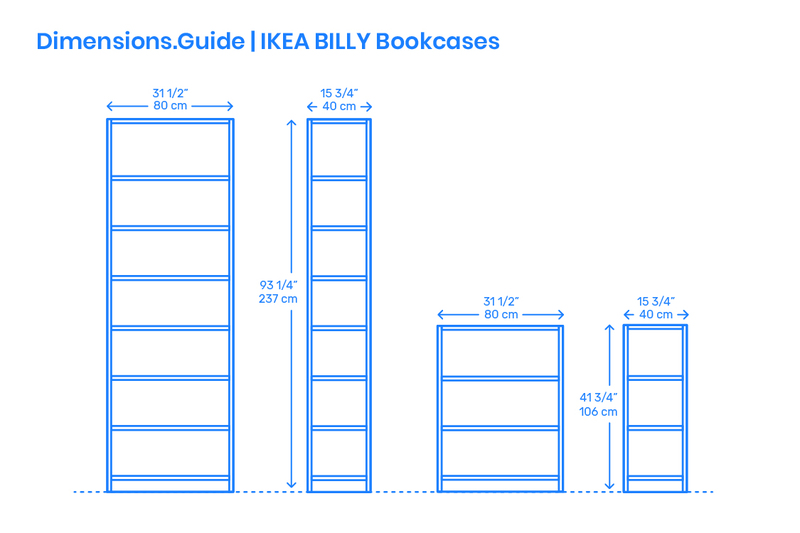 The IKEA Billy bookcase can be further customized with glass doors, a height extension unit, and a range of plastic-coated or veneered surface finishes.